The saying “A fish out of water” was coined in 1483 by the British poet Geoffry Chauser. In The Cantebury Tales he writes, “…a monk, when he is cloisterless; Is like to a fish that is waterless”.9 But the fact of the matter is, some fish actually do venture from the water, and it may not be as awkward as you’d think. If prehistoric fish hadn’t prevailed against this limiting stereotype, then tetrapods (animals with four limbs) as well as humans wouldn’t have come to exist. So thank you fish. But before this post becomes a lesson in evolution, I’d like to examine some of my favorite extant amphibious fishes and how they thrive in various oceanic and aquatic habitats. Air-breathing mudskippers (Gobbidae) are one of the first groups of fish that come to mind. They spend a lot of their time in the littoral zone (nearshore), unsurprisingly on mud flats. There they build hypoxic (low oxygen) water burrows that they use for refuge and as a place to lay their eggs. One of the most researched species is Periophthalmadon schlosseri, or the Giant Mudskipper, which is native to the Indo-West Pacific. In a study done in Malaysia, researchers observed P. schlosseri, gulping air into their empty buccopharyngeal (throat) cavities before diving into their burrows, and reemerging with the air visibly gone shown by a lack of cavity expansion. Some dove into their burrows and did not surface again for 30 minutes!6 These adaptations are a modern day example of how part of the Gobbidae family have formed an amphibious niche. And the best part is, they’re cute as ever. Its name is a bit of a give away, but this fish has different roles in human society depending on where your location. The Thai walking catfish, Clarias macrocephalus, is a commercially important species in Thailand. The species is struggling due to urban development of wetland and swamp habitat. In addition to this, the health of its gene pool is in question due to genetic backcrossing of C. macrocephalus x C. gariepinus hybrids. C. gariepinus was raised in aquaculture to meet commercial needs but infiltrated the natural environment. The infertile hybrid compromises 90% of the production of the walking catfish in Thailand. This study in Thailand looked at the outbreak of the problem spatially and found that polymorphism (multiple forms) was higher in the Chao Phayra River than the Mekong river basin10. These findings should be used to implement affective conservation plans needed to save C. macrocephalus, the native species. Farmers need to be educated on the threats of genetic introgression in order to maintain successful aquaculture plans. Other parts of the world also have to deal with invasive walking catfish, but have no value for them commercially. Clarias gariepinus, native to Africa, was first reported in Brazil in 1999. It was found in the Sao Francisco, Grande and Doce river basins in Minas Gerais, Brazil. This area experienced massive floods in 1996-97, causing water levels 10 meters above average. The excess water paired with their humble walking abilities prompted their range expansion. This fish is destructive to non-native habitats because it has the ability to survive on a diverse diet. However, it prefers eating other fish and can have drastic affects on ichthyofaunal community structure. It is not known exactly how this fish was released in Brazil1. I would question this fishes’ resilience if it weren’t present in Florida. After all, are invasive species even allowed to be invasive anywhere else before making an appearance in Florida? (side note: there are >500 invasive species in Florida!!) The Asian walking catfish, Clarias batrachus, was first documented in the state in 19675. Due to their ability to breathe air and the construction of many new drainage canals, the walking catfish rapidly expanded its range. By 1975, its known range had increased from 10 to 18 counties and it occupied 25% of all freshwater in Florida3. This range expansion fueled more research. Scientists noticed that these catfish exhibit synchronous aerial respiration behavior8, meaning that individuals of a group will breathe simultaneously or one after the other7. C. batrachus does not exhibit this behavior in its native habitat, so it was hypothesized that it had evolved this in Florida, likely to lessen the chance of an individual to be subject to predation while respiring. They surface to breathe very rapidly and then submerge themselves in deep water to rest in areas shaded by vegetation8. Yet another display of plasticity! As neat as these fish are, they raise many concerns as to how they affect the natural ecosystem. The impact of these predatory fish is dependent on multiple factors that influence their population ecology, and for this reason it is hard to predict how they will impact other species2. On a lighter note, I first spotted these guys squirming across a parking lot during my freshman year of college after a heavy summer thunderstorm. Just wow. Alticus arnoldorum, the Pacific leaping blenny, is my favorite walking fish. It also jumps and climbs. The axial twisting of the Pacific leaping blennies’ tail has allowed it to establish itself in new niches. This morphological innovation is considered so because it aids in diversification and ecological advantage. In this study a few different blennies’ jump kinetics were observed. These blennies included: Alticus arnoldorum, Andamia reyi, An. tetradactyla, Blenniella caudolineata, Entomacrodus niuafooensis, E. striatus, Istiblennius lineatus, and Praealticus labrovittatus. The Alticus genus was well studied for its movements on land since it was considered the most terrestrial of all of the blennies. High-speed cameras were used to capture footage of all of the blennies movements and leaping velocities were calculated. The study concluded “terrestrial movement is stereotyped”. Meaning that, even though terrestrial blennies, like the Pacific leaping blenny, spend more time on land, the genera of amphibious and aquatic blennies also initiate terrestrial movement in the same way. All species observed would create a “C” shape to initiate jumps and begin with the same preparatory force. The terrestrial blennies, however, exhibited the greatest jumping forces in all three dimensions. Pacific leaping blennies have the strongest jumps, likely because they rely on this mobility to defend their rocky territory. The axial twisting of their tail allowed them to jump roughly seven times farther than aquatic blennies and 5 times farther than the amphibious blennies4. A. arnoldorum leaps aren’t their only impressive trait. In another study, researchers investigated how predation and population density may influence the life history of A. arnoldorum. Life history was defined in the classical sense, meaning that the researchers looked at the relationship of reproduction and growth rate. Between populations of Pacific leaping blennies from different Indo-Pacific islands, there were significant differences in life history. Specifically, they found that changes in the density of adult blennies had a greater affect on life history than predation. This made sense because on land, these blennies are not subjected to predation as much as their ancestors may have been in the water. Instead, they are more sensitive to shortages in resources, and this affects older blennies more than adolescents. However, their ability to plastically change their life history based on where they settle as larvae, implies that this species has the potential to exploit more areas through its resilience12. For such a small, short-lived (< 1 year) fish, its behaviors and adaptability are overwhelmingly remarkable. Amphibious fish, mobile on land and in sea, are living examples of why fish are the evolutionary winners. Their ability to diversify paved the way for modern tetrapod evolution. Other amphibious fish that weren’t mentioned but are worth investigating include: the Northern Snakehead, California grunion, Climbing Perch or Gourami, African Lungfish, and Epaulette shark. Amphibious fishes existing and evolving to life in the intertidal zone has implications for this ecotone. Perhaps the intertidal provides an area for fish to adapt to a wider range of environmental pressures and could serve as a source of biodiversity through adapted resilience11. Other than their evolutionary implications, amphibious fishes boast many other reasons for adoration, whether it is their air breathing abilities or their feats of acrobatic athleticism. Mudskippers, bichirs, walking catfish, and the Pacific leaping blenny are a small handful of fishes that debunk the ideology of a “fish out of water”. Alves, Carlos Bernardo Mascarenhas, Volney Vono, and Fábio Vieira. “Presence of the walking catfish Clarias gariepinus (Burchell)(Siluriformes, Clariidae) in Minas Gerais state hydrographie basins, Brazil.” Revista Brasileira de Zoologia1 (1999): 259-263. Baber, Matthew J., and Kimberly J. Babbitt. “The relative impacts of native and introduced predatory fish on a temporary wetland tadpole assemblage.” Oecologia2 (2003): 289-295. Courtenay, Walter R. “Additional range expansion in Florida of the introduced walking catfish.” Environmental Conservation4 (1978): 273-275. Hsieh, Shi-Tong Tonia. “A locomotor innovation enables water-land transition in a marine fish.” PloS one6 (2010): e11197. Idyll, Clarence P. “New Florida Resident, Walking catfish” National Geographic6 (1969): 846-851. Ishimatsu, Atsushi, et al. “Mudskippers store air in their burrows.” Nature6664 (1998): 237-238. Kramer, Donald L., and Jeffrey B. Graham. “Synchronous air breathing, a social component of respiration in fishes.” Copeia (1976): 689-697. Loftus, William F. “Synchronous aerial respiration by the walking catfish in Florida.” Copeia 1 (1979): 156-158. Martin, Gary. 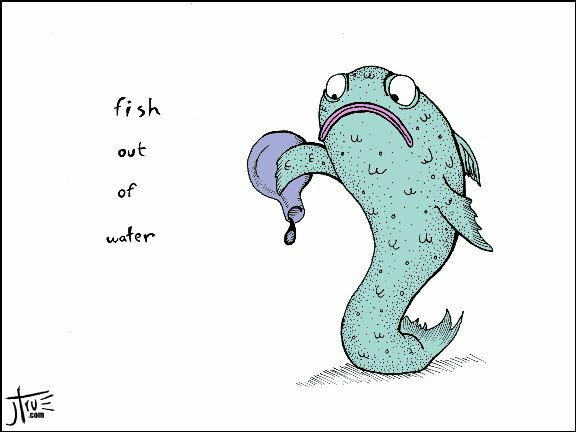 “‘A Fish out of Water’ – the Meaning and Origin of This Phrase.” Phrasefinder. N.p., n.d. Web. Na-Nakorn, Uthairat, Wongpathom Kamonrat, and Thawatchai Ngamsiri. “Genetic diversity of walking catfish, Clarias macrocephalus, in Thailand and evidence of genetic introgression from introduced farmed C. gariepinus.” Aquaculture1 (2004): 145-163. Ord, Terry J., and Georgina M. Cooke. “Repeated evolution of amphibious behavior in fish and its implications for the colonization of novel environments.” Evolution8 (2016): 1747-1759. Platt, Edward RM, and Terry J. Ord. “Population variation in the life history of a land fish, Alticus arnoldorum, and the effects of predation and density.” PloS one9 (2015): e0137244. Standen, Emily M., Trina Y. Du, and Hans CE Larsson. “Developmental plasticity and the origin of tetrapods.” Nature7516 (2014): 54-58.